Through their endowment fund at BHACF they are working to sustain their future! We are thrilled to work with Black Hills Area Habitat for Humanity as one of our newest endowment partners! Nonprofit organizations play an important role in maintaining the health and vibrancy of the Black Hills region. We believe in their work and we are committed to helping them be successful. 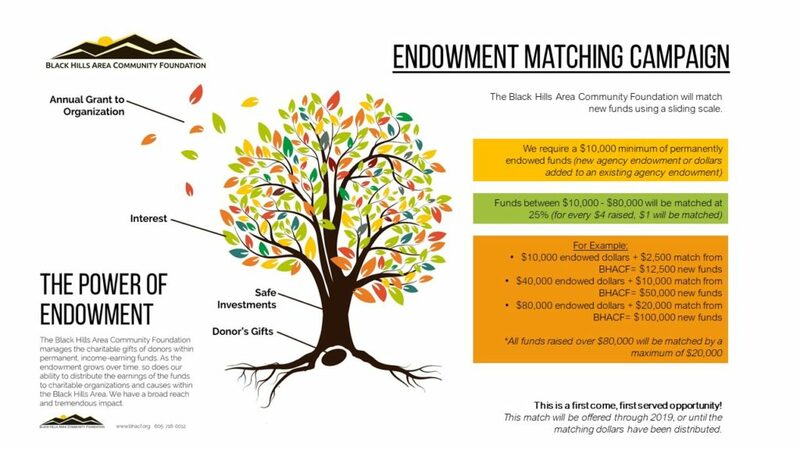 The Black Hills Area Community Foundation maintains a solid commitment to build a strong network of local nonprofits. Community organizations are important partners in understanding the needs of our community and where our collective resources can be useful. We provide opportunities for funding, and also facilitate collaborations and connections that help nonprofits reach their goals. Our grant programs, designed to help nonprofits build internal capacity and deliver programs to the communities they serve. When you establish an agency fund with the Black Hills Area Community Foundation, you will create peace of mind and an annual source of support for your organization. We manage many funds established to provide perpetual support for local nonprofits. Whether you choose an endowment or a designated fund, you will enjoy the benefits of our professional administration and investment oversight. We handle complex gifts, paperwork, investments and we can help your donors and their advisors with potential planned gifts. can focus on your mission and other priorities. ~View your fund activity through our online portal. possible future board neglect, short-sighted invasion or potential misuse. goes out of business or ceases to fulfill it original mission.